As product lifecycles continue to shrink and product complexity increases at a feverish pace, reducing the time it takes to introduce new products has become a strategic imperative for companies everywhere. Yet in order to speed up product introductions, businesses must have clean and accurate product data that's consolidated and concise across sales channels and the back-end systems that support them. Otherwise they risk creating confusion, errors, logistical problems, compliance issues, fines-and an unacceptable rate of product introduction failures. 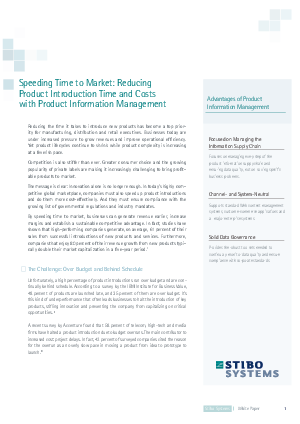 This executive brief from Stibo Systems explains why product information management and master data management platforms are key to getting products to market faster. And, it provides a business perspective on how these platforms help gather, manage and share product information and related digital assets within the enterprise and across the supply chain.